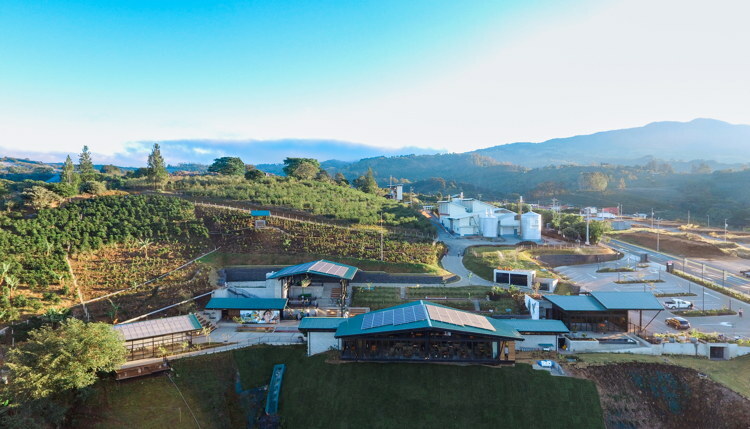 Today, Starbucks Coffee Company (NASDAQ: SBUX) opens the doors to its Visitor Center at Hacienda Alsacia, located on the company’s 600-acre (240 hectare) coffee farm on the slopes of the Poas volcano in Costa Rica. Hacienda Alsacia is a working farm that has served as a global research and development facility for Starbucks since 2013. Now open to the public, visitors will have the chance to experience coffee from seed to cup and see firsthand the agronomy work the company has been supporting and investing in for more than two decades. “Much like the premium retail experiences we are designing around the world, the Visitor Center at Hacienda Alsacia is a fully immersive space and now, for the first time ever, Starbucks is connecting our customers to the entire coffee ecosystem from seedling to the craft of brewing,” said Howard Schultz, Starbucks executive chairman. Designed by Starbucks in-house design team known for creating the “third place” experience in its Starbucks stores and its premium Reserve Roasteries, this 46,000-square foot Visitor Center is an experiential environment helping to educate visitors on the full coffee ecosystem. Visitors can tour the space on their own or with a guide, discovering everything from a coffee seedling nursery to a greenhouse with new, disease-resistant coffee varietals, coffee fields with ripe cherries at harvest, in addition to a wet mill and drying patio. These hands-on experiences culminate at a Starbucks café where coffee from Hacienda Alsacia is roasted fresh onsite and served using multiple brewing methods. The menu is inspired by Starbucks premium Reserve brand. All this work is in support of the goal to make coffee the world’s first sustainably sourced agricultural product. In 2015, Starbucks became a founding member of the Sustainable Coffee Challenge, a growing coalition of more than 90 diverse industry, NGO and government organizations led by Conservation International. The Sustainable Coffee Challenge is convening the sector to sustain the future supply of coffee while helping to ensure the prosperity and well-being of farmers and workers and conserving forests, water and soil. Since 2012, Starbucks has been operating stores in Costa Rica with its license partner, Premium Restaurants of America, now with 11 stores in addition to our Farmer Support Center and Visitor Center. Costa Rican coffee has been a part of Starbucks core offerings since it opened its doors in 1971, most recently a limited-edition offering of Hacienda Alsacia single-origin packaged coffee for customers around the world.